← House of Heroes – Suburba: Still stuck in the ‘burbs with the Xanax teens and me. 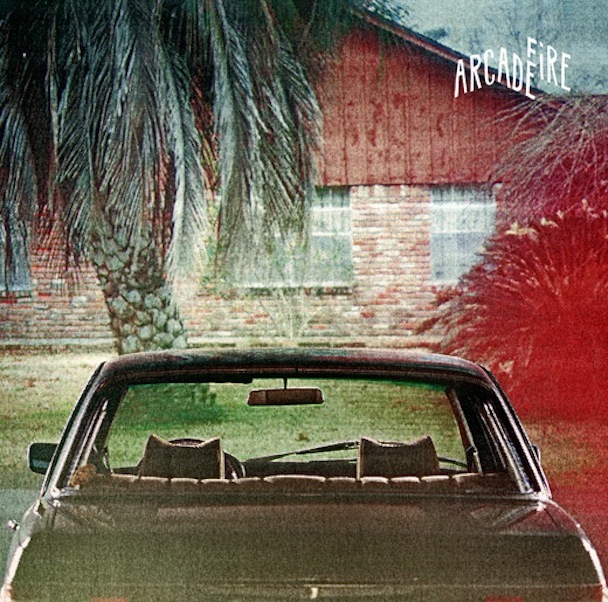 Arcade Fire – The Suburbs: The music divides us into tribes. You choose your side, I’ll choose my side. In Brief: Probably Arcade Fire’s most difficult record to appreciate. A drive through The Suburbs asks a lot of the listener, but I’m learning to enjoy the ride. I’ve been learning to appreciate the music of Arcade Fire very slowly over the past two years and change. It’s been a long and somewhat difficult road – for every song that trots out a bevy of obscure instruments and goes for the big, dramatic sweep with choral backing vocals, there’ll be another one that feels a bit stuffy, if not downright abrasive, thanks to the occasionally overexcited yelping of frontman Win Butler. (I mean the vocal kind of yelping. Though I suppose he might take the time to go online and rate his favorite record stores.) I had first listened to the band circa 2005 after hearing praise heaped on their debut, Funeral, a record which I declared “boring” at the time. I really needed my head checked when I said that, since dull moments on that album are actually quite rare, and I think my real gripe was that it started off more primal than melodic and found its balance farther in, when I wasn’t paying attention. 2007’s Neon Bible was the record that opened it up for me, balancing the mood a little better throughout even if it was guilty of a little whiplash in that department. This encouraged me to give Funeral another shot, and I eventually found it to be quite an addictive record, actually the better of the two. Knowing what this band could accomplish when they fused aggression and melody in the best possible ways (Funeral‘s “Neighborhood #3 (Power Out)” and Neon Bible‘s euphoric “No Cars Go” ranking among the better examples), and also gaining some appreciation for their lighter textures (see “In the Back Seat” and “Ocean of Noise” for my personal favorites in that department), I found myself anticipating the band’s long-awaited new record in the summer of 2010 more than I thought I would. …the music. This is one of those bands that has typically explored the “baroque” side of indie rock, their charm often being that they can base a powerful rock song around piano, violin, accordion, hurdy-gurdy, and even a freaking pipe organ just as easily as they can base it around the guitar. You’ll hear some of that here. But you’ll also hear a long succession of tracks that seem to want to take rock music back to its most bare-bones structure of drums, bass, guitar, and vocals. That’s not always a bad thing – see House of Heroes‘ album Suburba released on the same day and covering some of the same subject matter – but it can get tiring when the band seems to perform their own work as if they’re at a distance from it. This results in a lot of tracks that could have either the hopeful backbeat of a classic like “Keep the Car Running” or “Wake Up”, or the rage of the aforementioned “Power Out”, but instead, they just sort of amble along. I’m almost certain that the recording process had something to do with it. On the one hand, you’ve got Win Butler’s statement that he wanted the record to resemble “the bands that I heard when I was very young, and wondered what those crazy noises were”, but with a few noteworthy exceptions, I’m hearing dull noises more than strange ones. Also consider this tidbit from Wikipedia: “The band pressed each completed song to a 12″ lacquer, then recorded it back for the digital master of the album. As a result, the CD and digital versions of the album sound the same as the vinyl, although, as with most recent CD and digital releases, there is some compression applied.” I’m convinced that this is what mushed all of the sounds together on so many of the songs that are based on just the “raw” elements. OK, so maybe it sounds like a much older rock record, and maybe the band has come out on the vinyl lovers’ side of the format debate. That’s fine, for the folks who want to pick up the vinyl. But intentionally recording to a format much older than vinyl and then using that as the master for even the CD and digital formats means that you can expect some loss. I’m sure that’s part of the charm for some audiophiles, but personally, I’d have loved to hear the difference in a crystal clear, fully “modern” recording of these compositions and then compared the difference for myself. As a result, I’m sure a lot of these tracks will sound more alive than ever in concert. But I’m stuck with “definitive” versions on the album that are, honestly, quite lifeless in several cases. 16 tracks of this can get old if you don’t take a break here and there. Despite all of that, the band really made the effort to come with a true “album” designed for folks who like listening to albums from back to front. It’s their most thematically consistent disc yet (even if it’s done to the point of tedium in a few places), and in addition to the occasional brilliant left turn or just plain old solid riff or melody, they get a few lyrical zingers in there from time to time that this middle-class working man approaching his mid-thirties can relate to. Even if I don’t fully agree with their recording methods or their ultimate outlook on this suburban world that seems so gloomy from their point of view, I can tell that they put a lot of thought and effort into the creation of these songs. In that sense, there are no big “mistakes” on this record, just things that I’d have done differently. Since I’m a critic, not a musician, I can’t be too harsh on them over any of these differences. All I can say is “I would have enjoyed it better if…”, and if you’re an existing fan of the band who enjoyed Funeral and/or Neon Bible for very different reasons than the ones I stated above, you can consider this to be fair warning that your take on The Suburbs is likely to be significantly different from mine. Jaunty piano is admittedly not the sort of thing I’d expect an Arcade Fire album to start off with. Their previous opening tracks had a seething intensity to them, while this is pretty laid-back on the surface – sing-songy and yet kind of maudlin in its tone. I have conflicting reactions to this – it’s interesting to hear Win pull back a bit to tell the wistful story of the neighborhood he grew up again and describe the process of “moving past the feeling” as he becomes an adult, taking on weightier concerns such as raising a family of his own. But it feels like there’s this… space… between everything. Sort of like there’s something missing that keeps the song from fully taking off, despite the fact that I can easily bob my head to the beat and sing along to the chorus. Turns out that there is more going on than I first noticed – some strings bleed through in the background that weren’t apparent to me at first, but it’s still the piano and the simple guitar strumming and percussion that dominate my attention here. It’s pleasant as title tracks go, but really just a bit of a warm-up before we get into the good stuff. OK, the driving drums and bass here are a bit more promising. This one sounds like it wants to be the new “Keep the Car Running” at times, but it takes a slightly more oblique approach with its melody, and it’s also got a pace that might be a tad too slow for the intensity it seems to want to build up. Win seems pretty dejected here, mentioning a couple times that “Businessmen drink my blood” in his typical fashion of overstating the case wherever possible. (See “Intervention” for the best example of this: “Working for the church while YOUR FAMILY DIES!! !” Sheesh.) There seems to be a conflict here, between selling out to the whims of society just to avoid being alone, and taking a stance against it while knowing it’s a much lonelier road. Win seems to admit to being on the defeated side of this equation, but he also hints at being ready to open his mind and try the path less traveled. The song is brimming with anticipation because of this – working its way towards a boil, but never quite reaching its peak before the clipped crash of a cymbal ends the whole thing. I’m normally a big fan of complex rhythms. But for some reason, it often bugs me when a band’s idea of a non-standard time signature is something that fools you into thinking it’s 4/4 but just drops or adds a measure here and there. That’s sort of what the band is doing here, with its dry, workmanlike guitar strum imitating the skipping record describes in the lyrics, while the drums take a brief pause for that extra measure just to make sure everything lines up. It’s hella awkward at first because the ear expects the driving 4/4 that we eventually get as the song settles into its refrain. That’d be fine if the performance was exciting to listen to once my ears adjusted. But it just sort of ambles along, as if intentionally trying to sound as indifferent and emasculated as possible. I have no doubt that all of this is intentional. But it causes the song to feel like it just drags on and on, far earlier in the album than any song should be allowed to drag. As happens many times on this album, you can hear it building up, the strings simmering in the background to add to the intensity, but then it just sort of dissipates and allows the song to stumble to its conclusion (which, as it turns out, is a rather unimaginative fadeout). The band goes a bit darker for this one, with the acoustic guitar looping through an ominous chord structure while the string section whinnies about in the background. It’s the sort of thing that creeps up on you and sticks in your head for hours, which would be fine if not for the chorus that gets stuck there just repeating one word again and again: “RO-co-co-ro-CO-co-ro-co-CO-ro-co-CO.” It’s an actual word and everything – a type of architecture, actually – but when you ruminate on just about any word for that long, it really starts to sound like gibberish. The fact that this motif is used to describe yuppy teenagers who use “big words” to sound smart doesn’t help matters. If I were going to cite and example of a “big word” used just to sound smart, I sure as hell wouldn’t pick one that only had six letters. To be fair to this song, it’s perhaps the first one on the album that keeps its promise of upping the tension and keeping it there. That’s largely thanks to the female contingent in the band – Sarah Neufeld on the fiddle and Régine Chassagne on backup vocals. The two give the song an eerie, ethereal texture to balance the thickening of the electric guitars and percussion. It does a good job of keeping the song from being a muddy mess. Still, I’m irritated enough by the silly stutter of a chorus and the heavy-handed point that the lyrics are trying to make, that this ends up being one of my least favorite songs on the album. …And they’re off! The women are once again the highlight of a song, as Sarah’s fiddle darts forth with furious energy rivaling “Flight of the Bumblebee”, while Régine takes over lead vocals on the album’s most fast-paced anthem. It’s interesting, hearing her wistful, almost childlike voice in this context – there’s almost a desperation to it. She’s calling out to someone who isn’t there, or else who can’t be heard above the din – and it’s a magnificent din. Her husband, for his part, lays down a thick haze of electric guitar, and the drums are going full-throttle, and really, the whole thing is exactly the shot in the arm that the album needed at this point. it’s too good to last – after some muffled cries in French (Régine’s native language), the song gradually fades into a single chord that takes us seamlessly into the next track. This is probably my favorite track out of the lion’s share of them that Win sings lead on. it’s mid-tempo, but pretty catchy from the get-go, based on its recognizable guitar riff and its handclap rhythm. Of course, even at his most anthemic, Win can’t help but get caught up in his crapsack world, singing of cars breaking down on the way to visit his old hometown, and continuing to obsess over the act of becoming a jaded adult and selling out to the upper class. He’s mastered the subject matter so well in these lyrics that I really can’t complain – the best line on the entire album might just be “You never trust a millionaire quoting the sermon on the mount/I used to think I was not like them… but I’m beginning to have my doubts.” You can decide for yourself how a “city with no children” can possibly contain all of the annoying, smart-@$$ed kids described in nearly every other song. my feeling is that there’s a loss of innocence here, or else it’s the lament of the upper-class couple who seems to have everything their suburban neighbors want, but who can’t have children of their own. Either way, the imagery of “A garden left for ruin by a millionaire inside of a private prison” is quite haunting. This is one song where I think the lyrics do a fantastic job of upping the intensity, to the point where I’m OK with the music just bumping along at a steady rate. The synths come out to play here, or at least, as much as anything can possibly sound “playful” in a song whose title declares it to be about the lack of celebration. The beat is danceable, yet subdued, and there’s this harmonic whine riding above it all that sounds an awful lot like the outro to U2‘s “With or Without You”. The conclusion to this little saga seems even more depressing than the setup in the previous song – economic issues come to the fore as a couple watches the stock market crash and their dreams disintegrate. Whatever conflict had been hidden behind the big house and nice decorations in the first part of the song comes to the fore as they decide to part ways. It’s easy to miss the sheer sadness of it against the glitzy backdrop, but without it, the song would probably be a chore to get through. Must be really weird, to sing a song like this with your own spouse on backup vocals. For all of the trouble the band went to in their attempt to make the vinyl and CD sound alike, I should note that they messed with the track order between the two mediums. So if you’re following along on the vinyl, skip to side four, track three, for this displaced song, and then come back to the beginning of side three after that. This is another song where the band is being almost alarmingly economical with the instruments – I notice little here other than a chiming guitar and some tumbling about on the drums – there’s almost no dimension to the rhythm section, and I’m not sure whether that’s a conscious choice to make the track feel a bit hollow or just an artifact of the odd production. However, when the first segment of the song reaches its end and they kick the tempo up a bit, the drums get almost tribal and the whole band seems to go into overdrive, proving that they’ve still got it, but were just restraining it. It works well enough, since the song is about warring neighborhood factions formed by such a trivial thing as musical preferences – I figure you’ve got your headbangers on one side, your hip-hop heads on the other, or else you can sub in country or whatever genre dejected kids in suburban Houston might use as an excuse to hate each other. It seems like there’s a guy and girl caught on opposite sides of this silly war, causing a rift between them that causes the guy, as an adult, to wonder what the heck ever happened to her. “My old friends, they don’t know me now”, he comments, as if wondering whether it was worth losing her just to fit into his “tribe”. It probably wasn’t. Then again, what kind of band would this be if influences from across the tracks had crept in? We’ll never know. This track is a record about making a record. And while it’s a bit fuzzier than bands were allowed to be back in the heyday of rock & roll, it seems like the song intends to strip rock down to its most primal elements – a driving guitar riffing on the same chord over and over, a tireless backbeat, and a simple melody that vaguely hints at the part of rock’s origin which came from the blues. Depending on your perspective, this is either exciting or respective. The band seems to know that the audience will have their reservations, describing the kids who come to their concerts as the hard-to-please types, standing there with their arms folded tight (seriously, that’s a main motif of the song), as if to say “Alright, impress me.” I get caught up in the energy of this track sometimes, but at other times, I kind of want it to break into something different rather than just trailing off at the end. Part of the difficulty with having 16 tracks on an album is that I don’t feel like I get as much time to truly get attached to most of ’em. I think the folk/country influence might be coming to the foreground here. A synth tone hangs in the air that leads from the previous song into just about the most chilled-out acoustic guitar rhythm you could hope to expect from this band – it’s only a stone’s throw from Jack Johnson, now that I think about it. Of course, Arcade Fire doesn’t write songs about just chilling out – they can’t relax without regretting it later, after all. So just as you’re getting used to the easygoing beat and the tale of kids in a small town with nothing to do, the instruments all completely drop out – expect for that one synth tone, like the ringing in your ears when you’re suddenly faced with a silence you’re not used to – and the band goes completely without rhythm for the chorus, even though you can tell it’s following a metronome that you can’t here. It’s unsettling. Some might consider it brilliant. I consider it a bit dull, especially since the song peters out so suddenly when the guitar is brought back after the second chorus. It feels like half of a song. It’s rough going for me this far back in the album. This song ended up being one of the casualties of my memory, stuck in between a few others that were “just okay” to me at first, and so I had to go back and listen to it very intently to differentiate it from the lackadaisical track that it follows. It keeps a similar syncopated rhythm to “Wasted Hours”, actually, but the guitars are a bit more grumbly, the melody wanders about in more interesting ways, and the synths swirl up every now and then like a cloud of mildly angry bees. They actually strike a good balance between bouncy and haunting here, even though I’m growing a bit weary of all the despair (this time they’re decrying the advances in technology at the turn of the century, it seems), and the track honestly feels like it could have been a B-side and the album would be no worse for the wear. So, while we’re on the subject of lamenting advances in technology, this song chooses to hit the nail right on the head. A repeating note from the piano rings out to start it off, and the song smartly takes a gradual approach as it begins to hammer its rhythm into your head. There’s a connection that Win makes here, between the clever devices we’ve invented to entertain ourselves and keep people in touch, and our growing impatience and dissatisfaction with the tameness of our world. We used to wait for letters to be sent (which we now refer to affectionately as “snail mail”), now we send instant messages across the globe without a second thought. I relate to this song because I’ve been where he is – I’ve had those nights where the overstimulation of the entire Internet at my fingertips and the screen beckoning me to read just one more page of nonsense before turning it off results in that bright light seeming to permeate the insides of my eyelids as I try to sleep. It’s because the song establishes its specific observations so well that it can get away with a chorus so general as this: “Now our lives are changing fast/Hope that something pure can last”. The song turns very bitter toward the end, making no secret of Win’s feelings toward an audience so used to this technology that they expect instant gratification: “We used to wait for it/Now we’re screaming ‘Sing the chorus again! '” I love how this angry cry builds toward a climactic note where that lone piano chord echoes off into the distance. Our second two-parter starts off with a real clunker. It’s perhaps Win’s most personal moment, stripped down to just his voice, strings, and an electric guitar, the scrapes of his fingers on the strings audible in the apparently empty room behind him. He recounts a drive through the endless rows of houses that he used to call home, decrying the sameness of it all and remembering how he and his buddies used to loiter around their neighborhood, getting harassed by cops who figured they were up to know good due to being out so late at night. The analogy he draws from this is overkill, if you ask me – the cop asks “Well, where do you kids live?”, to which his response is: “Well, sir, if you only knew what the answer’s worth. Been searching every corner of the earth.” That’s it. That little bit of melodrama leaves us with uncomfortable silence as we wait for Part II to kick in. Part II, however, is sweet rescue of the most unexpected variety. I should have seen this coming, given the band’s experimentation with electronica on the “Half Light” suite, but holy cannoli, I wouldn’t have expected a disco sendup from these guys – let alone such a highly enjoyable one – in about a million years. The programmed keyboards are in full-on early 80’s mode here, while the melody hearkens back even further, practically winding up as a twisted reflection on Blondie‘s “Heart of Glass”. (That’s one of those songs that I had heard in my younger days, but only knew through osmosis, so while this track rang with familiarity before I’d read any other reviews pointing out the similarity, I wouldn’t have known the actual song title or artists without those other critics’ assistance. Thanks, folks who actually remember the 70’s!) Régine absolutely knocks it out of the park on lead vocals here, her slick observations about endless malls and condos and the like matching up perfectly with the music, which gets an angry guitar chord thrown in every now and then to remind us that this isn’t a fully mechanized work. Against all odds, this lovely little piece of kitsch winds up as my favorite track on the album. It continues Arcade Fire’s tradition of placing something gorgeously climactic as the second-to-last track on an album (“Rebellion (Lies)” and especially “No Cars Go” previously achieved wonders in this department), while also dethroning Funeral‘s excellent finale “In the Backseat” as my favorite Régine song. It’s almost disturbing, how many times I’ve played this track in comparison to the rest of the album. If they can find a way to pull this one off live, I bet it’ll be killer. Bonus points if they find a way to make the floor light up! Take the title track, pull out its piano and rhythm section and pretty much all instrumentation except for some odd warbling in the background, and you get this little snippet, which bookends the album with a few fragmented reflections leading back into its chorus. Kind of a downer epilogue to the record, but the obvious bookend cements its status as a concept album. So that’s the sum of my conflicted, messy feelings about The Suburbs. You can tell that I really got excited about some tracks, and appreciated the artistic expression in others while not quite getting there in terms of tracking with whatever they wanted to make me feel. Arcade Fire’s always been a bit like that for me – I can appreciate what they’re trying to do, but I can’t get too involved or else I’ll feel pretty darn awful at the end of it. I’ve had others tell me they actually find hope in this album, instead of feeling depressed by it. I can sort of see that. Personal experience with the subject matter that the album deals with – or lack of belief that these experiences are as lamentable as Win seems to describe them – can probably cause each listener to see it in a slightly different light. And I guess my light is a half light. Maybe a 75% light, since I see more good than bad, but the bad still lurks. Still, hopefully I’ve shed enough light on it that you’ll be interested in viewing this project from your own unique angle.